Alumni gather in Central Park for the Terry Fox Run. Julia Reid, Artsci’08, did not know anyone when she moved to London, England, in 2008, so she attended Queen’s Alumni Branch events as a way to meet people and make friends. Ms. Reid is now the Queen’s University Alumni Association’s (QUAA) New York City Branch President, taking over from Lisa Dowd, Artsci’85, who is still a key supporter of the group. Ms. Reid can’t promise you will meet the love of your life, but feels the Queen’s network is a great way for people to meet and make new friends. New York City is one of 50 Queen’s alumni Branches and Chapters located around the world. 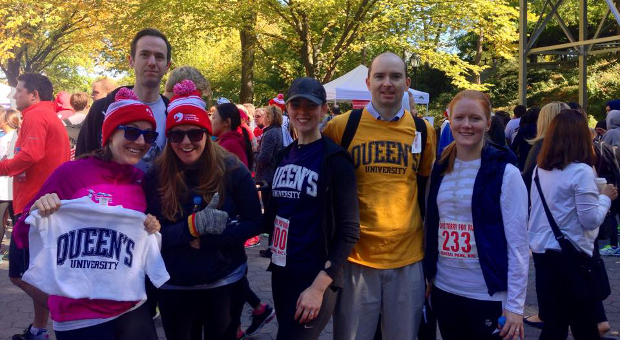 The Branch volunteers do their best to help the 148,874 Queen’s alumni located in 153 countries around the world. Some people come to NYC Branch events to network and make business connections while others want to make friends and reminisce about campus life. Ms. Reid tries to host events for both crowds: for the social types, a Christmas party downtown and a skating party in Central Park; for the networkers, an evening at the Harvard Club with author Sean Silcoff, Com’92 who talked about his book chronicling the rise and fall of Blackberry, and a cocktail networking evening at a midtown rooftop bar hosted in partnership with Young Canadians in Finance. On May 14, they are taking a private tour of the Whitney Museum. Stephanie Ryalen Batesky, Artsci’92, remembers holding her three-week old son while reading an Alumni Review article seeking volunteers. She wanted her son to have Canadian connections, and felt volunteering for NYC Branch events would be a good way to give back. So far it has produced many benefits. The alumni network has helped Ms. Ryalen Batesky land several jobs, including work at Scholastic Publishing and Forbes Magazines. Ms. Reid is looking to build a group of dedicated volunteers to help build the Branch. She is currently looking for candidates to fill two roles – a Vice President of Communications position and a Vice President of Events post. For more information, see the NYC Branch website page or send them an email. For a full ist of all alumni Branches around Canada and the world, check out our Alumni Branches Directory. To find out about alumni events in your area, see our Alumni Events Calendar.